Narnia… where the last king makes a stand and sad farewells turn to joy…where the Adventure begins again. The Unicorn says that humans are brought to Narnia only in time of greatest need—and that time is now. The great Lion Aslan, the heart of Narnia, is missing. An impostor roams the land in his place, enslaving Aslan's loyal creatures and spreading treachery and lies. 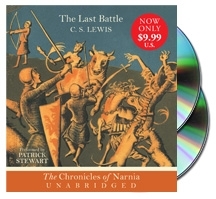 Only King Tirian and his small band of loyal followers are left to fight the last battle in this magnificent ending to The Chronicles of Narnia.